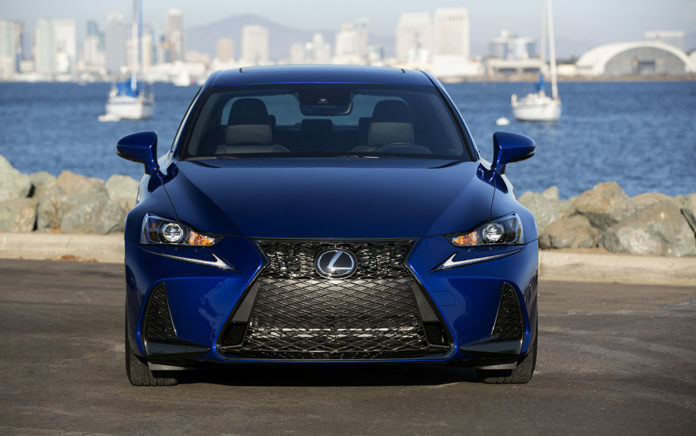 The eye-catching 2018 Lexus IS 300 is a compact-luxury sports sedan, which debuted as a third-generation model in 2013, out fashions such rivals as the Audi A4, Cadillac ATS, Infiniti Q50, BMW 3-Series and the Mercedes C-Class. The IS acronym, which stands for Intelligent Sports, was tweaked in 2017 with added exterior and interior styling and tech features. The redesigned Lexus IS 300 looks more aggressive with its bold headlamps, larger air intakes on the front bumper, fenders and grille. In 2018, the Lexus IS received a few minor changes. They include standard safety and performance features, including an additional increase of 5 hp on the direct injection 3.5-liter V6 engine, which generates 255 horsepower. Additionally, the four-cylinder rear-wheel-drive (RWD) IS 200t was renamed the IS 300 RWD, and the V-6 now offers an all-wheel-drive (AWD) model. Both the IS 300 and IS?350 are available in RWD and AWD and offer the F SPORT package for buyers who want more performance and an aggressive sporty design. The F Sport package is available for all IS models. It includes a large three dimensional mesh grille with a jet black metallic finish that is also highlighted on the brakes, F Sport tuned suspension, five spoke 18-inch wheels, Mark Levinson 5.1 surround audio system with 15 speakers, a 10.5-inch touch screen display, perforated leather sport seats and heated steering wheel with paddle shifters. Safety features on the Lexus IS includes the Lexus Enform Safety Connect and Enform Service Connect, which are now complimentary for the first 10 years of ownership. The optional F Sport trim comes with a 1-year trial subscription to the Lexus Inform Destinations. Expect to pay $40,200 MSRP for the IS 300 AWD and an additional $3,145 if you want the F Sport package.. Along with a few others options and destination charges, the price as tested came to $49,679.